He is the stuff of legend and has been spotted in woods, swamps, and mountainous regions around the world. He is BIGFOOT! And he will be roaming the building and grounds of the Fall River Public Library on 104 North Main Street on Saturday, April 20 from 11:00 a.m. to 1:00 p.m. See if you can spot the legendary cryptid in this unique and exciting scavenger hunt for the whole family! 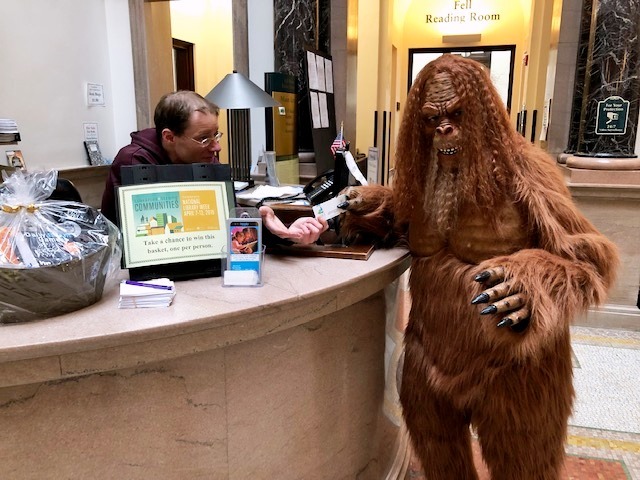 Families can register for the Bigfoot search starting at 11:00 a.m. in the library’s meeting room where they will receive their official “Spot Bigfoot” entry form. Listed on the form will be several items participants must locate that are hidden throughout the library, both indoors and out. Find all 5 items on the list and you will be entered to win a Bigfoot gift basket filled with books and other surprises. In addition, a FREE GIFT awaits all children who successfully complete the scavenger hunt. Throughout the event, families will be encouraged to keep a sharp eye out for the elusive and shy creature as he will be roaming the library’s stacks, Fell reading room, children’s room, and even the outdoor grounds. Find him, and the friendly, furry behemoth will be pleased to pose for a selfie with you! For further information contact David Mello at 508-324-2700, ext. 4.